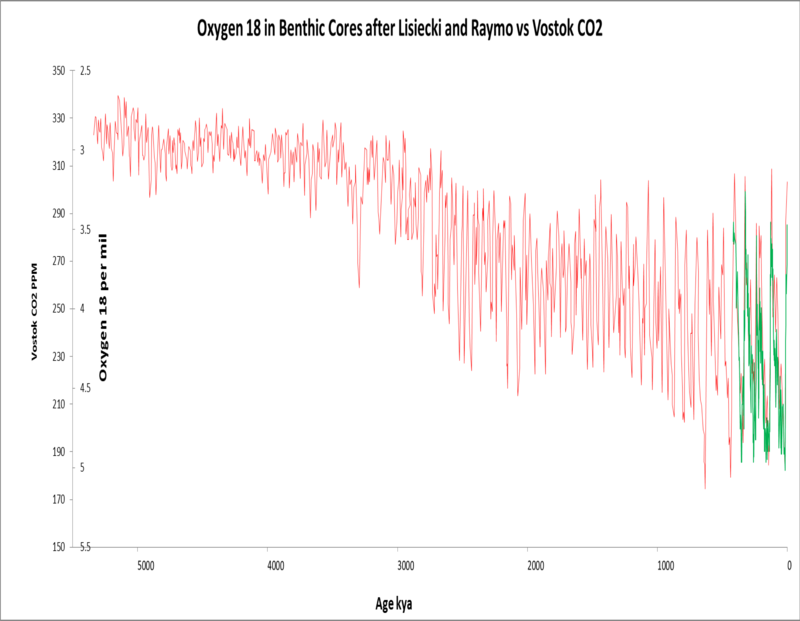 Anyone with a big picture perspective can see that there is no correlation between CO2 and temperature at any scale except the clear dependence of CO2 on temperature in the ice cores; and temperature control of the variation of CO2 but not the trend at human scale. You don’t need any statistics to see there isn’t much correlation at Phanerozoic scale. Things get a lot more certain when we zoom in to half of the Phanerozoic scale or 300 million years. If there is any relationship here it is CO2 lagging temperature by about 30 million years. That is way too long for any known process except weathering and even that is a stretch. Calling this zero correlation as well. Things change when we zoom in to the scale of 5 million years as the planet descended into current ice age, the Pleistocene. It is well known that temperature drives CO2 in the ice core data. There is also temperature data from 18 Oxygen from the Ocean Drilling Project that goes back much further. 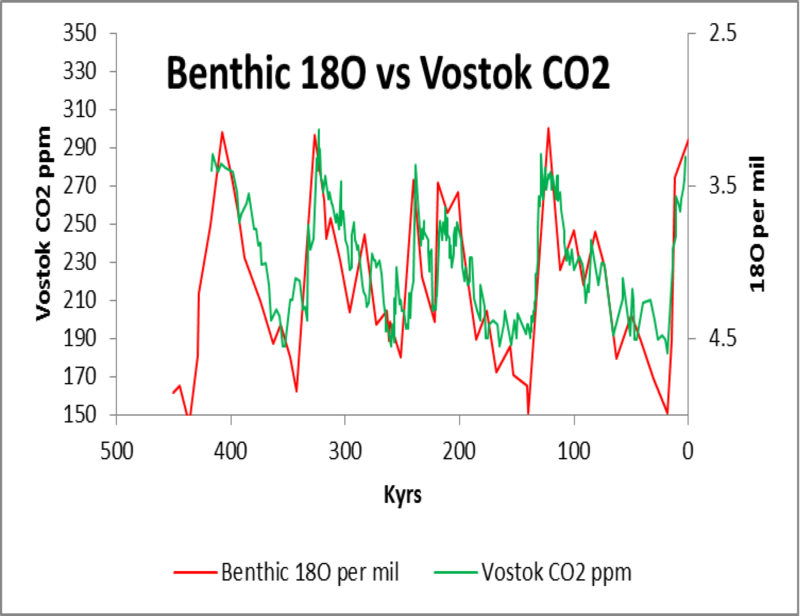 In the graphic above the 400 thousand years of Vostok CO2 is plotted against the 18O series and the agreement is very good! There is good reason to suspect that the same relationship goes back 5 million years. Here we zoom in to a half million years to see some detail. 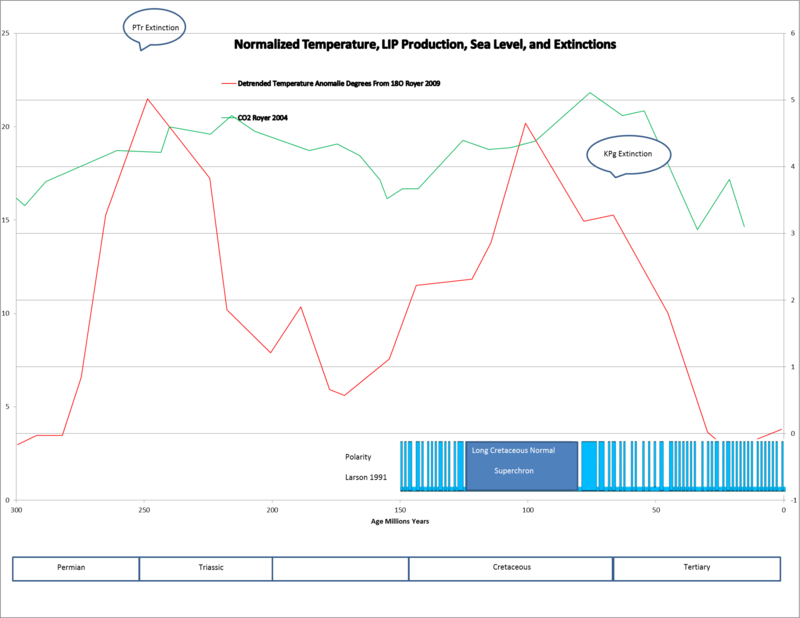 The well known relationship of temperature driving CO2 in the ice core temperature data holds for the seafloor drilling temperature data as well. In the graphic above after Ferdinand Englebeen we zoom into the human scale of 35 years. Although the trends are different, temperature captures most of the variation in CO2. We can say that at human scale temperature drives the variation but not the trend. We have zoomed wildly from 500 million year scale, to 250 million year scale, to 5 million year scale, to 50,000 year scale, to 50 year scale. 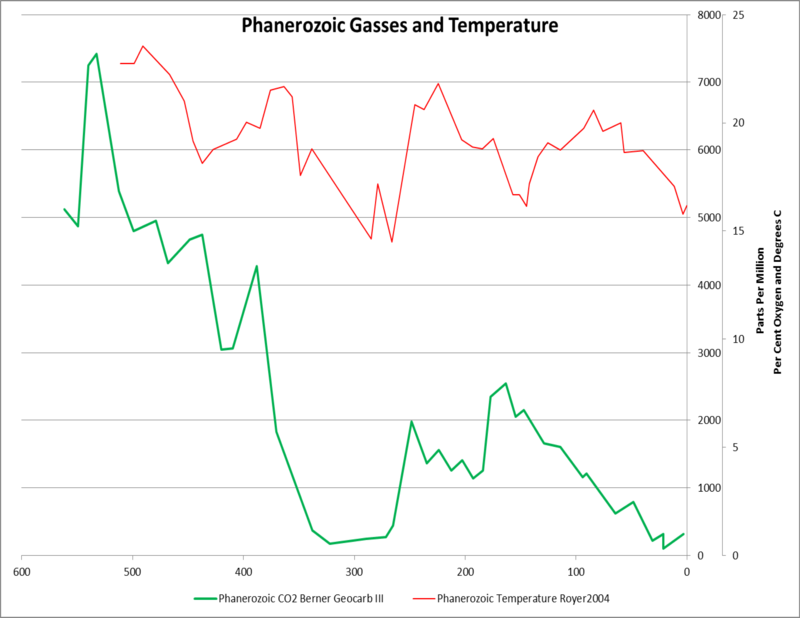 We find no rational correlation at Phanerozoic scale, CO2 dependence on temperature at Neogene scale, and temperature control of CO2 variation but not the trend at human scale. I don’t know and I doubt you do either. The separation of variation from trend at micro human scale is interesting. Obviously they are both important. The separation cannot continue indefinitely or it would negate the well established temperature dependence of CO2 at the higher Neogene scale. We need to find the inflection points where temperature control of only the variance transitions to control of both the variance and the trend, and in much deeper time the transition from temperature control to zero correlation. Much can be learned from this exercise and it will be the subject of a future post. 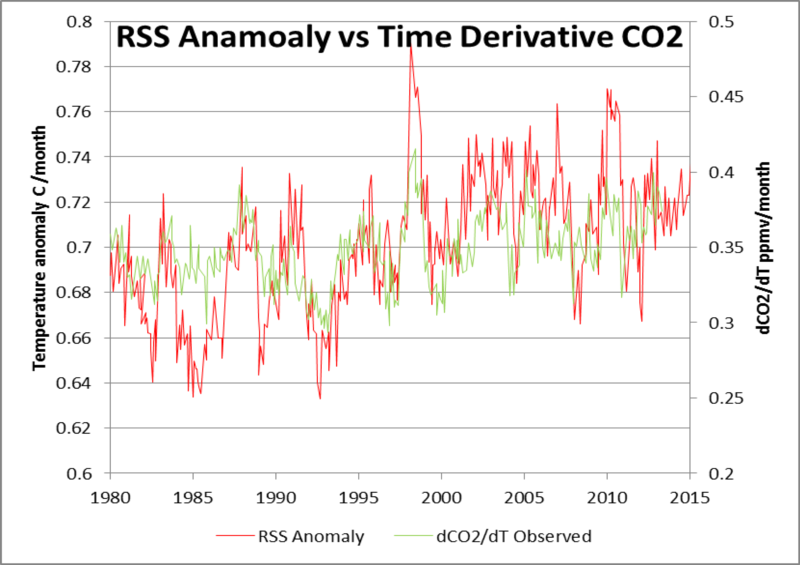 For now we have established that CO2 does not significantly control temperature. Why not? We will answer this in a future post. This entry was posted in Climate and tagged CO2 don't do Jack. Bookmark the permalink. As you say in yout opening paragraph [CO2] and global average temperature correlate well over the last 850,000 years as demonstrated by ice cores. The correlation is a consequence of Henry’s Law that says the solubity of gases in liquids falls as temperature increases. While most of what you write about is above my pay grade, I have added you to my “Favorites”. My field is quantum electro-optics (lasers) so your use of MODTRAN impressed me. Catling & Robinson created a convective-radiative model of the atmosphere that works well for all seven bodies in our solar system with significant atmospheres. I am trying to improve on the R&C model by adding cloud layers but have not made much progress owing to pressure of (paid) work. I had no idea you were diggingintheclay. Think I’m still following. I recall several years ago you and I (as trunkmonkey) were the only skeptical commenters at SKS, having extensive discussions with Phil Scadden. You left when they began editing your comments and they finally kicked me out. Thanks for the links. The R&C post has many fine comments and I had not seen it.